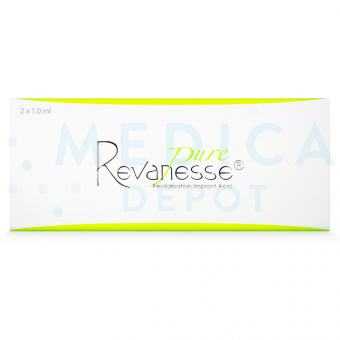 You can buy Revanesse Pure from us and complete your order online from this website. You can also submit your order by telephone, fax or email by contacting our customer service representatives. Ordering online with us is easy, just add the product to your cart and enter your mailing address to calculat shipping costs. Note we offer free shipping with a minimum purchase. Take advantage of our wholesale prices and ongoing promotions to cut your operating costs and gain an edge over your competitors. Are you getting a cheaper price on Revanesse Pure from your current supplier? Let us know, we will meet or beat their price. Revanesse Pure is a biorevitalizing solution that is composed of 14mg/ml of non-crosslinked hyaluronic acid. The hygroscopic feature of this filler makes it perfect to deeply hydrate skin while restoring its firmness and elasticity. While most hyaluronic acid injectables add volume to the skin for filling wrinkles, Revanesse Pure uses minimal volume to plump and smooth fine facial lines effectively and improve the look of aging skin. 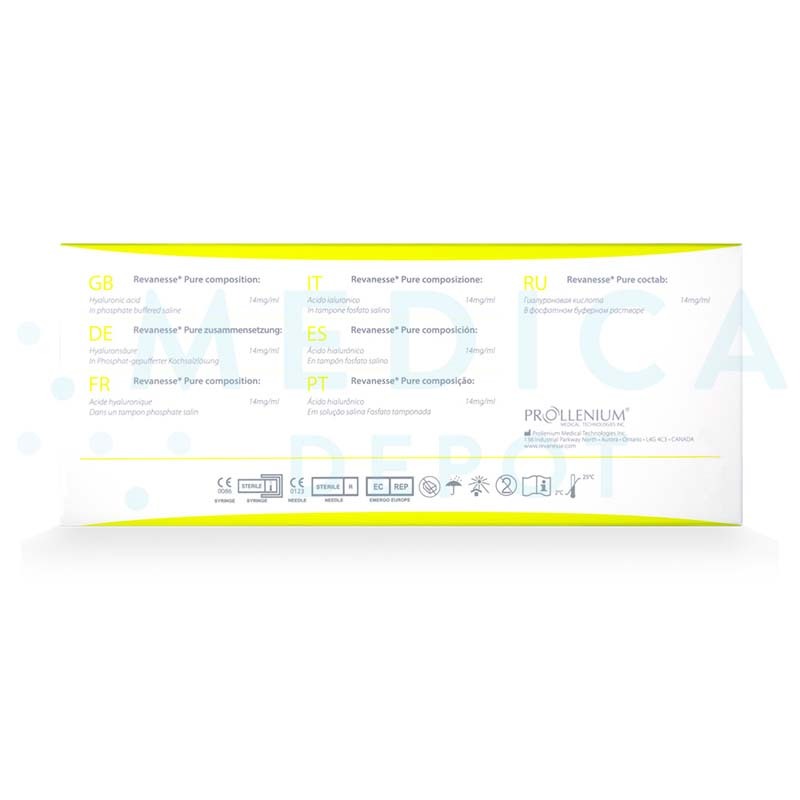 This filler is designed by a Canadian pharmaceutical company, Prollenium Medical Technologies Incorporation. 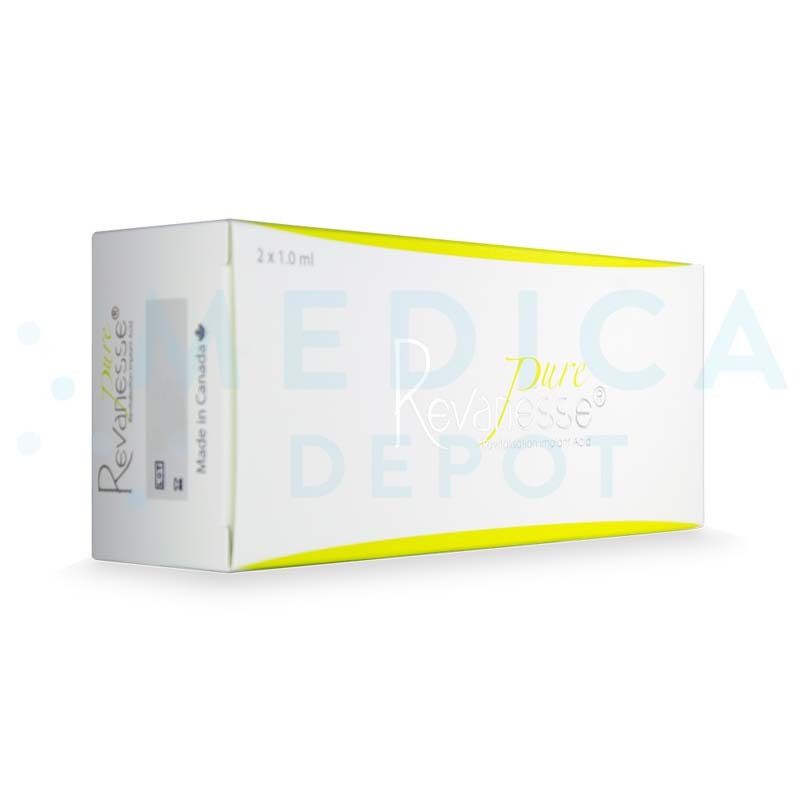 Each box of Revanesse Pure is supplied with 2 syringes preloaded with hyaluronic acid implant, 4-30G ½” needles, and package insert. What are the benefits of this injectable gel? 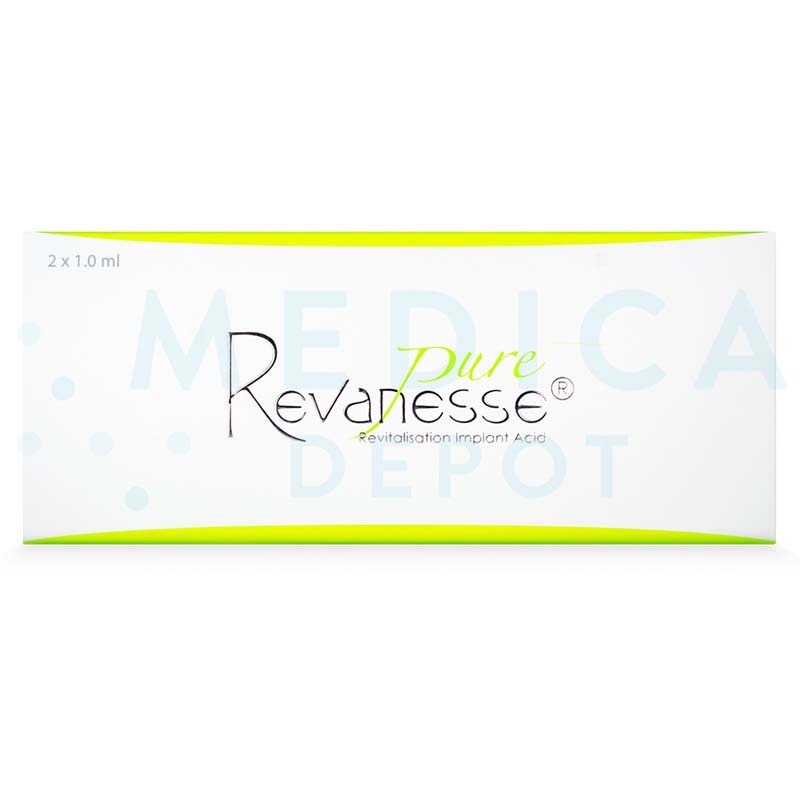 Revanesse Pure is a genuine, brand-name injectable gel from Prollenium, an innovative North American manufacturer. It is made of non-crosslinked hyaluronic acid, a naturally-occurring hygroscopic substance that is renowned for its skin hydrating and nourishing properties. Since it only contains pure, non-cross-linked hyaluronic acid, this filler restores skin hydration without adding unnecessary volume. The skin rejuvenating aesthetic implant helps keep skin hydrated and refreshed with regular maintenance treatments. How does Revanesse Pure work? This injectable gel is made of pure hyaluronic acid which is not cross-linked. This lack of cross-linking helps the gel distribute evenly within the superficial dermis to restore moisture without excess volume. Once you inject this hyaluronic acid-rich solution into your patient's skin, the implant holds moisture to restore skin hydration and deliver subtle volume, resulting in smoothing of fine facial line. What are the ingredients in Revanesse Pure? 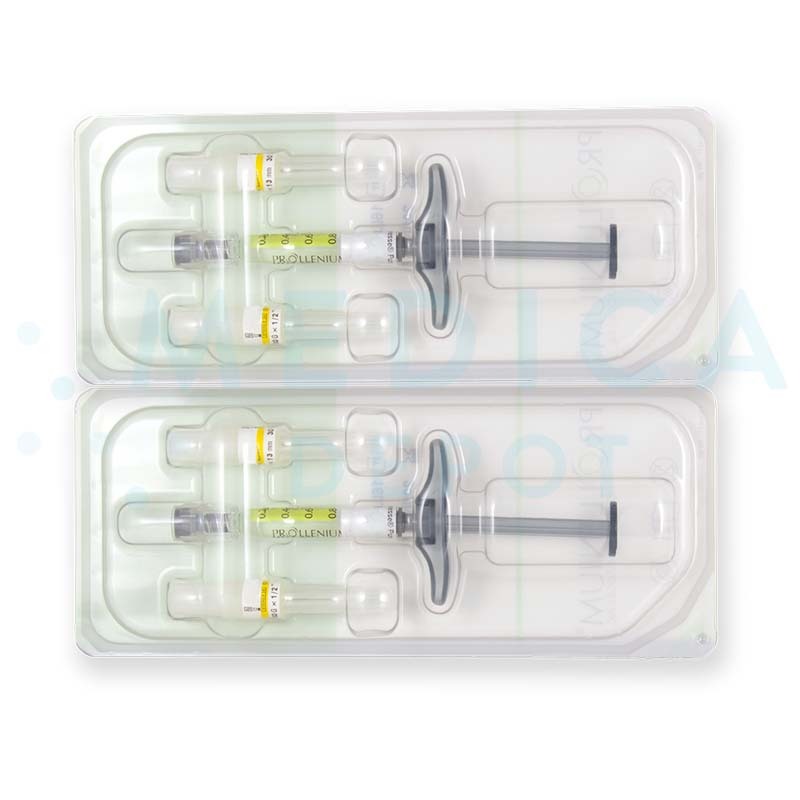 This injectable solution contains pure hyaluronic acid which is not cross-linked and is of non-animal origin. Although the hyaluronic acid molecules are extracted via biofermentation, they are still purified and tested to be absolutely tissue-friendly without inducing any immunogenic reactions. Other Revanesse fillers are made of cross-linked hyaluronic acid to add volume to the skin, as well as to correct wrinkles and facial fat loss. Revanesse Pure, in contrast, is not cross-linked, so it can restore skin moisture level without adding unnecessary volume. Before injecting this biorevitalizing solution, perform a thorough review of your patient’s medical history and conduct a facial assessment. The initial consultation session should also be reserved for educating the patient on the possible side effects that they might encounter. After obtaining their informed consent, commence the treatment session by cleaning and sanitizing the proposed treatment areas. Assemble the medical device by attaching 1 of the 30G needles provided and inject the non-crosslinked hyaluronic acid gel into the superficial dermis. Following adequate correction, gently massage the treated areas to ensure good gel integration. Discard any remaining gel and used syringes and needles. When should I use this biorevitalizing solution? For best results, administer this hyaluronic acid gel monthly for 4 consecutive months. After 4 months, administer the treatment regularly to maintain the aesthetic results. The initial treatment requires 4 monthly sets of injections, followed by maintenance treatments after that to maintain the results. The necessity of touch-up injections vary on an individual basis, depending on their skin health, age, lifestyle, and the amount of filler injected. The manufacturer does not provide longevity data on single treatments. What areas of the body can I treat with this aesthetic injectable? You can use this skin-rejuvenating solution to treat aging skin on the face, neck, decolletage, and hands. Who is an ideal candidate for Revanesse Pure treatments? The ideal candidate for these treatments is a patient who has yet to experience pronounced signs of aging, such as wrinkles; instead, it is ideal for patients who may be experiencing early signs of aging such as dehydration, loss of skin firmness and elasticity, and formation of fine lines. Why should I purchase Revanesse Pure? This pure hyaluronic acid filler delivers instantaneous skin hydrating results and fine line correction, without unnecessarily adding excess volume to the skin. What are Revanesse Pure's side effects? Side effects usually resolve within a day or 2 if they appear on the face, or can up to a week if they appear on the lips. Educate your patients to seek immediate medical treatment if any of the side effects exacerbate or persist. The list above is not exhaustive; read the package insert for more possible side effects.